This product requires the base game EVERSPACE™. Encounters is the first major expansion for EVERSPACE™, enriching the game world with new story characters and questlines, a brand-new player ship, freighter-loads of novel equipment, additional enemies, and much more. A NEW RIDEImpress your peers with the new Colonial Sentinel, a medium fighter craft, and make use of its powerful shield and advanced electronic warfare capabilities. Mileage may vary.NEW FRIENDS?Play five new quest lines and meet new characters, each with their own motivations and agendas. Ever met a robot bounty hunter with a French accent who would rather create than destroy? Of course not. Or an alien scientist who sends you on a hunt for space creatures? That's right. Creatures... in space.EXTRA FIREPOWERSix new primary and secondary weapons, such as Lightning Guns and Plasma Throwers, will ensure continued enjoyment when dispatching your opponents. Ever wanted to barrage multiple foes at once with projectiles? The Seeker Missile Battery aims to please. You deserve this.TOOLS OF THE TRADEEMP Generators? Decoy Holograms? Why, yes! More than ten additional devices and consumables will make surviving Cluster 34... as hard as before. But even more fun.THE FINAL TOUCHIf you're not too busy dying, the new G&B factory stations are well worth a visit. Here you can upgrade your ship, refine resources, and delay your inevitable fate by means of repairs. WAIT... THERE'S MORE?If a simple paint job didn't do it for you, why not fly in style with one of the five new fashionable ship skins? And if your journey isn't challenging enough already, we've got you covered with even more achievements. Happy hunting, pilots. Try not to die. 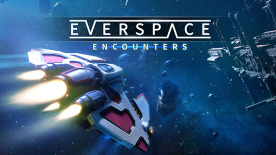 EVERSPACE™ is a trademark of ROCKFISH Games GmbH. All rights reserved. All other copyrights and trademarks are the property of their respective owners. Requires the base game to activate this DLC.